I *love* Betsey Johnson! She's my fave designer, and by admitting such a thing, you've probably guessed that I prefer a fun, not-so-serious approach to dressing. I own several Betsey creations in all their girly gloriousness ~ they just make the wearer feel oh, so special. Lucky for us, Betsey has ventured out into the world of accessories including purses and bags. 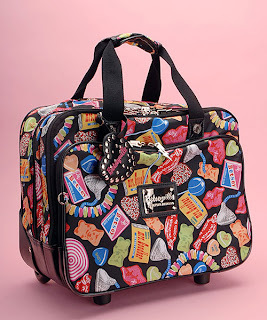 Check out this gem -- a travel bag affixed with candy wrappers a la Betsey!! Gummies, bubble gum, they're all along for the ride, guaranteeing a tasty trip for you to savour.